Home About SaraPath Our Pathologists Kevin M. McCormack, M.D., Ph.D.
Dr. Kevin M. McCormack has been a surgical pathologist and dermatopathologist with SaraPath Diagnostics®, since 1987. He is board-certified by the American Board of Pathology in anatomic and clinical pathology and Dermatopathology. Dr. McCormack was born in Lansing, Michigan. He received his Bachelor of Science degree from Michigan State University, and his Ph.D in pharmacology and toxicology from the same university in 1979. Dr. McCormack continued his studies at Michigan State University, receiving his medical degree in 1983. He completed a postdoctoral fellowship at Michigan State University’s Department of Pharmacology and Toxicology in 1981 while in medical school. From 1983 to 1986, Dr. McCormack served his residency at Duke University Medical Center’s Department of Pathology and was appointed chief resident there in 1985. He completed a fellowship in dermatopathology at Duke in 1987. Dr. McCormack is a member of the American Society of Dermatopathology, American Medical Association, College of American Pathologists, Florida Medical Association, and the Sarasota County Medical Society. A prolific researcher and author, Dr. McCormack has published over 50 journal articles, case reports and abstracts, and contributed chapters to several books. His teaching experience includes tenures at Michigan State University, Lansing Community College, and Duke University. Dr. McCormack has been passionate about the study of pathology from the very beginning. “I wanted to work in a field that would continue to challenge me throughout my career. Pathology keeps me energized and engaged. 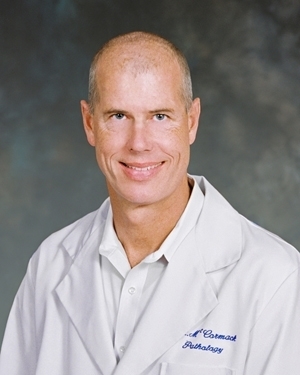 Working together to determine diagnoses that ultimately lead to cures is extremely fulfilling.” An ardent fitness enthusiast, Dr. McCormack is a world-ranked master swimmer and a member of the Sarasota YMCA Sharks Masters swim team. As a member of the Manasota Track Club, he also enjoys running and has competed in numerous races. He and his wife, Amy, have a son, Ryan, and a daughter, Kelly.